Traditionally, process orchestrations are in the center of attention, both in business process management research and industry uptake. In recent years, however, the view broadens: Not only local process orchestrations are investigated, but also interactions of processes, i.e., process choreographies. In this talk, the evolution of the Business Process Modeling Notation regarding process choreographies will be discussed. In particular, we show how recent research results have helped shaping the BPMN, and we point out research questions in choreography design and analysis. The talk concludes with a presentation of the Signavio Oryx Academic Initiative, which provides free access to business process modeling software and exercises for academic use. 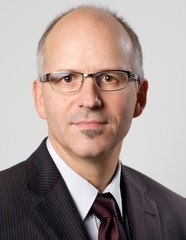 Professor Dr. Mathias Weske is chair of the business process technology research group at Hasso Plattner Institute of IT Systems Engineering at University of Potsdam, Germany. His research interests include business process management, process choreographies, process modeling methodologies, and service oriented computing. He leads Oryx, an open source project on a business process management platform. Dr. Weske has published twelve books and over 80 scientific papers in journals and conferences. He is on the steering committee of the BPM conference series. Dr. Weske has published a textbook on business process management. He is co-founder and Scientific Director of Signavio, a Berlin-based startup company that provides collaborative business process management.